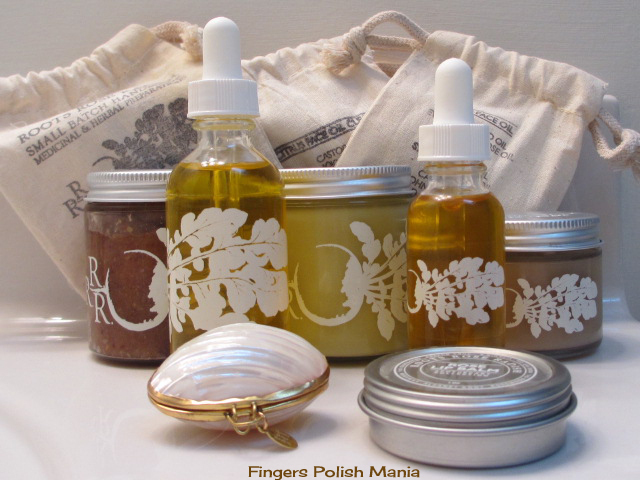 fingers polish mania: Attention Skin Care Junkies! I am always on the look out for great skin care. Being in my 40s, I have started to notice the lines getting deeper and more apparent. I have tried many things, spent a lot of money, but now I think I have finally found what I have been looking for. We are now aware of the fact that jojoba oil is the closest to the natural sebum our bodies create. This fact being populated by Ana at Nail Care HQ and her Pure Nail Oil. Yes I have jumped on her band wagon, but have also made my own jojoba nail oil using different oils than she uses. Saves money to make your own. Anywho, I was so excited to find this website that mixes small batches of all natural oils with jojoba as the main or prominent ingredient in most of the things she makes. She is a trained Herbalist and has done all the research for you. She also grows most of the ingredients and makes them all herself. I am so hooked that I am writing a post about it! I was not asked to do a review, I bought these products all myself and I have to say, I am in love. My face has never felt softer. I haven't been using it long enough to say about the wrinkles and things, but I am a convert and hope she never stops making this stuff! I have begged her not to! What am I talking about? It's called Roots Rose Radish. I saw an article in a magazine and now knowing about jojoba oil, I knew these had to be good products. Here are all the products I have so far. Don't they look pretty? They are shipped in those canvas bags that have the ingredients listed on them. You can get to the shop here. Yes there will be tons of links for today's post. I normally don't bother since we all are big girls and can Google right? I'm told they will ship international as well. I will talk about these in the order I have been using them, starting with two different cleansers. The first being a Honey Pecan Rose Face Cleanser. You can see most of the ingredient list on the canvas. This is a mild scrub and can be used daily. The honey and the jojoba keep your skin from getting the tight feeling after washing. I'm not normally a fan of honey-just don't like the smell, but this is not honey in your face, you know? I do like this a lot. The other cleanser I got is the Citrus Face Oil Cleanser. This is supposed to help with acne and I have that and I hate it! Just got this one, so I can't speak to the acne part yet. The thought behind this is that oil dissolves oil. The first time I tried the scrub above, I made the mistake of trying to remove my eye makeup with it. Bad news, got the scrub particles in my eyes. Not my proudest moment. 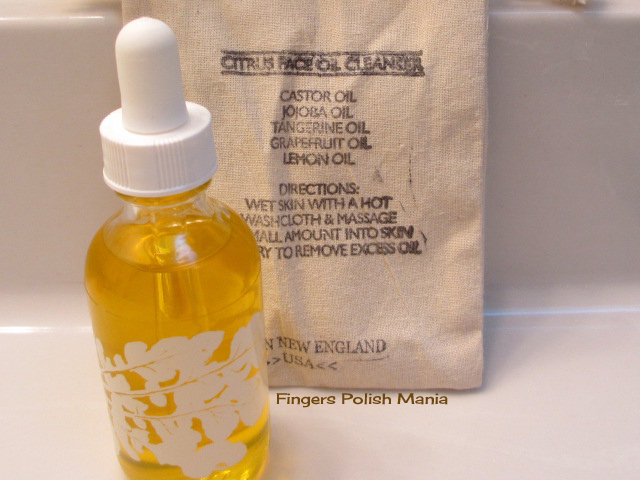 Yesterday what I did was, wet my face, I rubbed this oil all over my face, then added the scrub to my cheeks and chin. They weren't sold to be used together, I was just experimenting. I only used about 4 drops of this oil and a pinch of the scrub. This stuff will last a while. 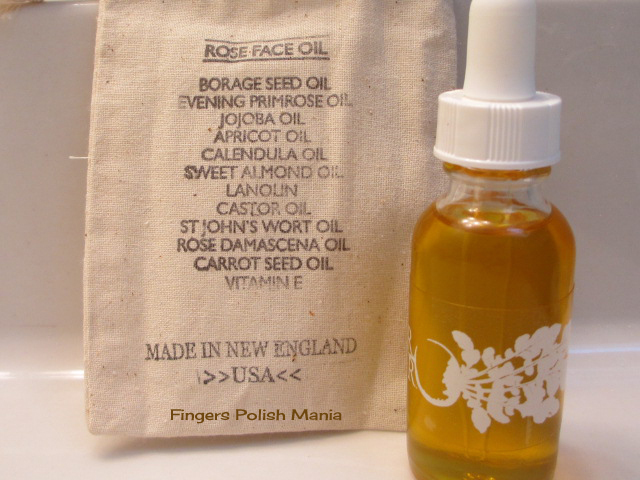 Next is the serum, which is the Rose Face Oil. This is the most expensive and decadent of the products. This has 12 oils that they have derived from stuff they grow. I used three drops as my serum, only at night though. For me, I don't want to use this during the day. Lovely stuff this is. 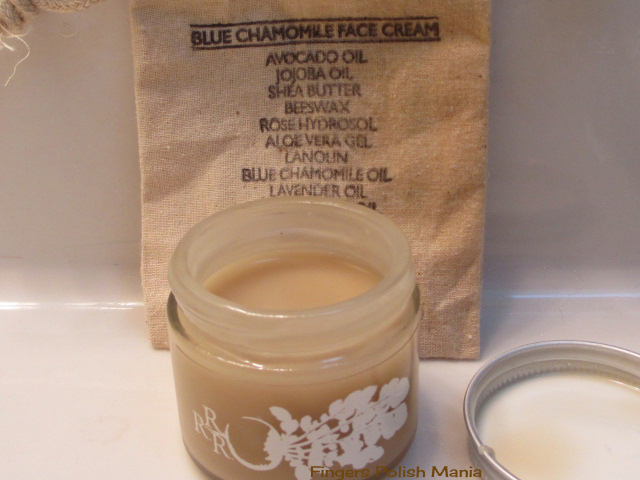 Finally, there is the Blue Chamomile Face Cream. When I first got this, it was during the serious heat wave we were having. The two products I received were all watery and melted. I kind of freaked a little. But because these are all natural, that will happen. I put them in the fridge and all was fine. I did have to get used to the fact that this lotion is the consistency of maple syrup. It does not get solid. It took me a few days to get used to this. Now I am totally in love. This leaves my skin so soft, I can't stop touching it, which is a bad thing because that's how you get acne! You can see the second ingredient is jojoba. There are more explanations on the website as to what each ingredient will do for you. I recommend you read those things, it's really interesting. So those are the face products. 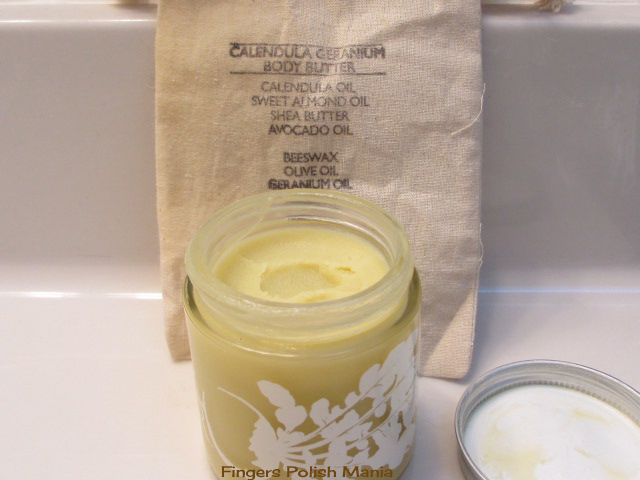 Next is the body butter It's called the Calendula Geranium Body Butter. This does not have jojoba in it and I wonder why? I'll have to ask them. This has the consistency of vaseline. This was one that came melted. It firmed up nicely in the fridge and now I have it on my night stand. You only need a pencil eraser size for your hands. It does take a while to soak in, but I love it. 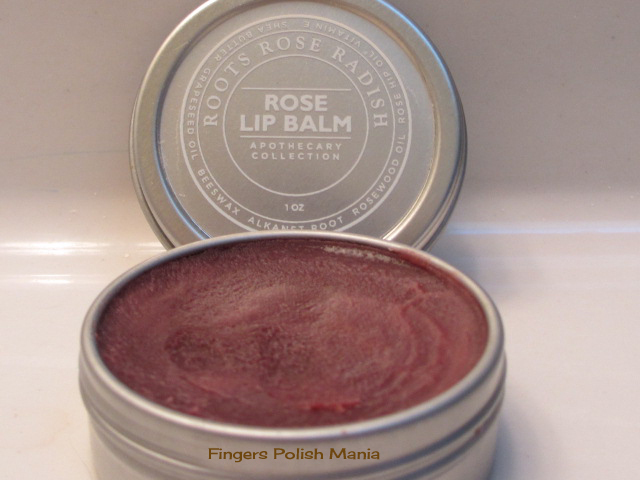 Next is the Rose Lip Balm. I have to admit, this is not my favorite lip balm. I am also a lip balm junkie. This is too oily for me. But I prefer chapstick so what do I know??? 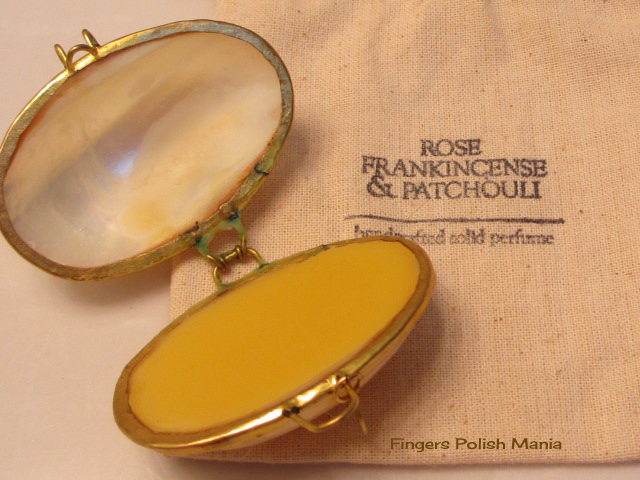 Lastly, we have the Rose Frankincense Patchouli Solid Perfume. This comes in a gorgeous shell that has had a pretty clasp attached to it. Go back to the first picture and you'll see what it looks like closed. I love Patchouli and this fragrance is just amazing. So there you have it. I have gone from La Mer and its WAY too expensive but very nice creams to this all natural, jojoba based organic skin care line. Next thing you know, I'll be growing my own clothes! HAHA. All jokes aside, these products make me very happy and I love them so much that I wanted to share them with you. I do believe this is the first non nail polish post I have ever done. I hope you liked it. No I won't be doing them all the time, but I do know there are skin care junkies like me out there that will love these products.